The Children's Village has several grassy areas where kids can play soccer and other sports. The campus of the SOS Children's Village in Tela, Honduras. The 12 cinder block houses currently are home to 42 children. SOS is one of the largest providers of residential care to orphaned, abandoned and neglected kids worldwide. 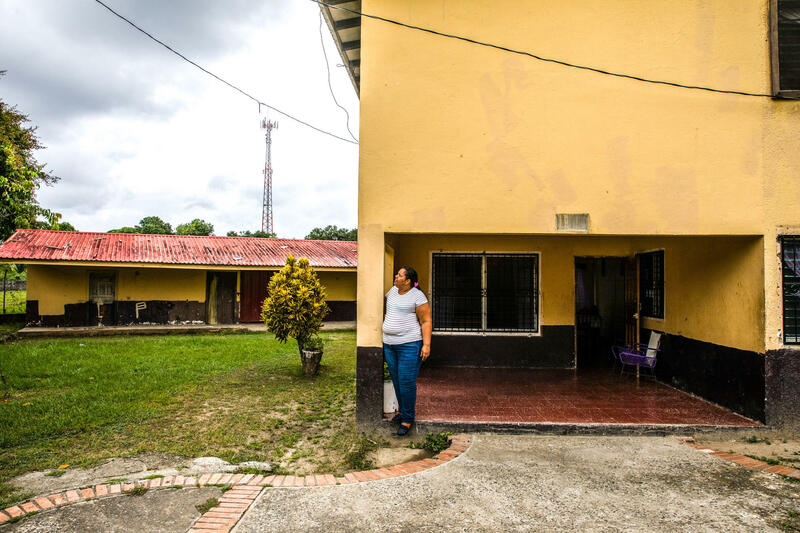 Sandra Hernandez is the "mom" for house #9 at the SOS Children's Village in Tela, Honduras. She currently looks after four teenagers. 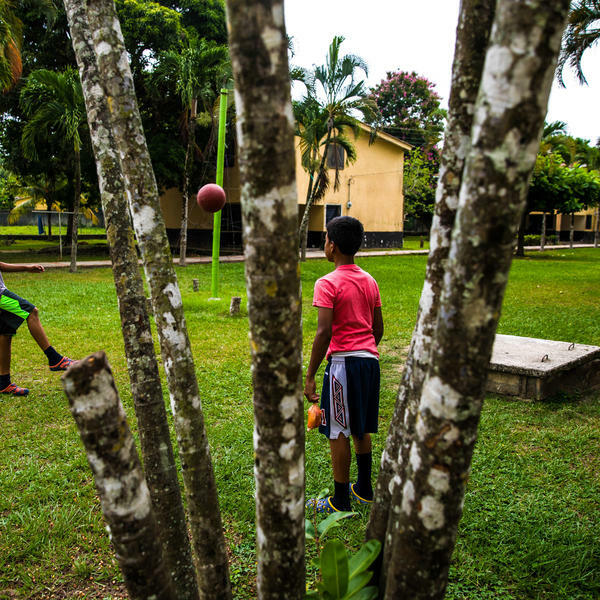 These teenage brothers live in house #9 at the SOS Children's Village in Tela, Honduras. The goal isn't to get them adopted out but to create a family-like setting in the institution. Naomi, who lives in house #9, shows off the sash she won in a competition to be queen of an anniversary festival at her school. 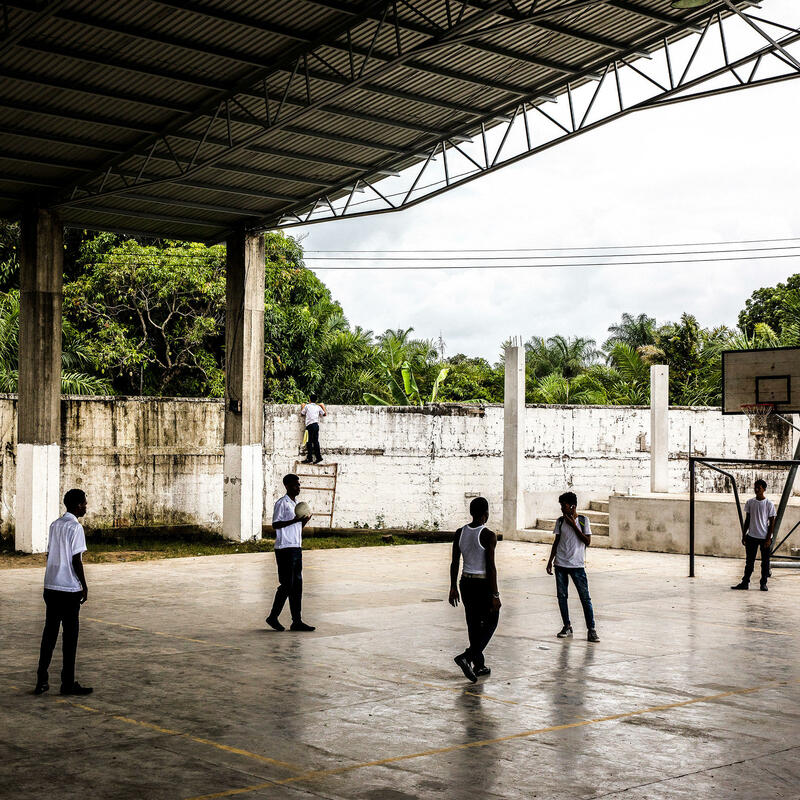 Some of the kids from the Children's Village attend this high school in the town of Tela. One of the math teachers says some of her best students come from this orphanage. Orphanages are falling out of favor. Ever since the horrific conditions in Romanian orphanages were widely publicized in the 1990s – naked children tied to cribs in overcrowded wards — there's been a movement in the international aid world to shut down orphanages completely. But according to UNICEF, there are still 2.7 million children living in orphanages worldwide. So what if someone tried to set up a good orphanage — a place where parentless kids could thrive? What would it look like? And what could it tell us about the basics of child rearing? It might look like this: A dozen kids piled on a couch watching a soccer match on TV while kids from neighboring houses drop by to chat. Other kids are preparing dinner in the kitchen. The kids call the employees of the institution "mom" and "auntie" while the staff call them "mi amor" — my love. The kids and the adults at the SOS Children's Village, an orphanage in Tela, Honduras, interact like a big extended family. It's a place where dozens of kids who've been separated from their biological parents for a variety of reasons now live. Some of the kids' parents are dead. Some have left the country. Some lost custody of their children because they couldn't afford to feed them. All the kids have been placed at the institution by court order. The director of the facility, Carolina Maria Matute, says what these kids need most is love. "A lot of love," she says. "A lot of affection." The resident social worker, Jenny Zelaya, also puts love at the top of her list. But it's also important that the children feel that the staff have their backs, she says. "It's not just a job," she says about working at this institution. "We take a real interest in them [the kids] succeeding and being able to achieve their goals." SOS Children's Villages is a nonprofit aid group founded at the end of World War II in Austria. The organization is remarkable now for the sheer number of children it has in its care. It's one of the largest providers of residential care to orphaned, abandoned and neglected kids worldwide, with more than 80,000 youngsters living in nearly 600 orphanages. SOS operates in 135 countries, primarily low- and middle-income nations. But it also runs four villages in the United States. There are six SOS Children's Village in Honduras, one of the poorest countries in the Americas. On a per capita basis only people in Haiti earn less each year than Hondurans. At the SOS Children's Village in Tela, the "mom" in house #9 is 45-year-old Sandra Hernandez. Hernandez describes herself as a sports fanatic. The house is known among the kids in the village as the place to go to watch soccer. Hernandez a die-hard supporter of the Spanish Futbol Club Barcelona. A blue and maroon Barca FC shield is pasted on the wall in the living room. But because Barcelona was eliminated from the Champions League tournament, Hernandez is rooting against Barcelona's archrival Real Madrid. The four teenagers in her house — three boys and a girl — refer to each other as brother and sister. Hernandez lives in the house full-time. When she takes her annual vacation an "SOS aunt" comes to stay with the kids for a week or two. "It's a family model," Hernandez says. "It's like a natural family." 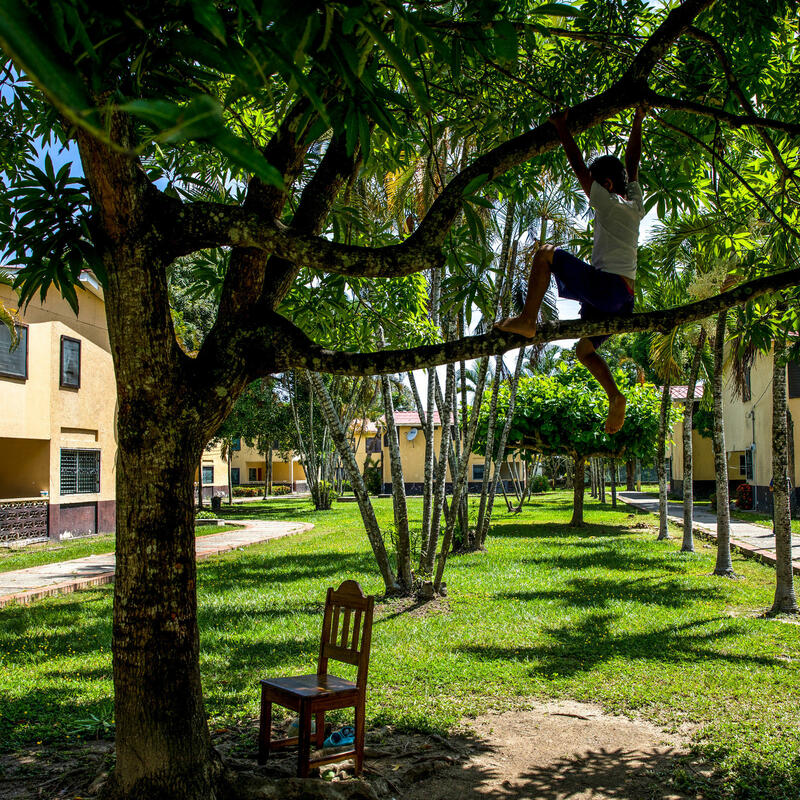 This SOS "village" is inside a large, fenced compound on the outskirts of the Caribbean coastal city of Tela. The 12 separate houses are connected by a footpath shaded by several giant mango trees. There's an open field where the kids often play soccer. Chickens scurry amid the bushes. Unlike some other orphanages, SOS doesn't offer these kids for adoption to families in wealthier countries in North America or Europe. The goal is to make this village their home and to raise these kids in their own culture. Some kids do leave before reaching adulthood — but only to be placed with biological relatives or, if conditions have improved, to return to their parents. The houses themselves are not fancy. They're identical two-story, cinder block buildings with a kitchen and a living room on the ground floor and four bedrooms upstairs. Built in the mid-1970s they resemble bland public housing from that era. Naomi was placed at the SOS Children's Village when she was 2 years old and has been living with Hernandez for the last eight years. The SOS model, Hernandez says, provides a structure that gives the children natural social connections. "It helps them a lot because they're not isolated," she says. Hernandez says this not just because she's worked here for ten years. She was placed at an SOS Village in the Honduran capital of Tegucigalpa when she was 3 and grew up there. "I lived the same situation as them," she says of the kids in the orphanage. At Sandra Hernandez's house the day starts early. At 5:30 a.m. the youngest boy in the house who's 15 is sweeping the back yard. Hernandez and Naomi are making breakfast. The two older boys stumble into the kitchen around 6:30. Hernandez is patting egg-size balls of dough into thick, traditional Honduran tortillas called baleadas. Soon the children will go off to school — not in the children's village but in the town. That's part of the SOS strategy: to integrate the kids into the community so they can develop social connections that will help them find jobs and homes and spouses later in life. One of the 16-year-old boys was just elected president of the student council, which is remarkable in part because he only returned to Tela a few months ago. He spent last year in a drug rehab program. "They choose one student to represent the school in various activities," Hernandez says. "And he'll represent his school when they have meetings of all the schools in the city." She is extremely proud of him. The daily routine at Hernandez's house is a bit complicated because Naomi goes to the morning school session and the boys attend in the afternoon. On this day, the school, Instituto Triunfo de la Cruz, is celebrating its founding 69 years ago. Naomi is one of a dozen contestants in what's essentially a beauty pageant to see who will be crowned "Señorita Aniversario," the queen of the anniversary festival. As she walks confidently onto the stage the announcer declares that her hobby is studying and she hopes to become a medical doctor. Naomi is one of three finalists — but doesn't win the top prize. Her 9th-grade math teacher, Jennifer Gamez, says Naomi is one of the best students in the school. "You explain something once and she gets it," Gamez says. "If she has a question or a doubt, she asks me about it. And her behavior is excellent." Gamez says many of her students live in poverty. Jobs are hard to come by in Honduras, but Gamez tells them that their situation in life doesn't determine their future. And Gamez says she's been extremely impressed with students who've come from the SOS orphanage. "I know a lot of them who've become professionals, they're good people who come from this village," she says. "I know a lot of people like that." There are also kids from the SOS Children's Village who struggle. The youngest member of Hernandez's household is one of them. One of his teachers says the 15-year-old doesn't pay attention. He talks too much in class, doesn't turn in his assignments. With a stern glare the teacher adds that he prefers to run around with his friends rather than do his work. Hernandez says she's aware of these problems and is trying to get him more focused. The big question is: Would he fare any better if he were living with his biological parents? Duke University professor Kathryn Whetten isn't so sure. Whetten has researched residential care for kids who've been separated from their parents for various reasons and says that orphanages aren't inherently bad. "We see the same continuum of bad and good care in the group homes as we see in the family settings," says Whetten. For the last 12 years Whetten has been following 3,000 kids who were orphaned, abandoned or for some other reason separated from their biological parents. The professor of public policy and global health at Duke is conducting the study in five low- and middle-income countries. Half the kids are in institutions of some kind — government-run orphanages, private group homes. The other half have been placed with extended family members. "What the kids really seem to need is a home-like environment," Whetten says. Regardless of whether they're placed with extended family members or in institutions, the researcher's found that the one thing the children need is a stable living situation. They don't do well if they're bounced from one place to another. Having consistent long-term caregivers and steady sibling-like connections to other kids is also important. "So creating a family-like environment is what is really important," Whetten says. "And that can happen in a family setting in a small home or it can happen in an orphanage slash institution slash group home like SOS." None of the SOS Children's Villages are part of Whetten's long-term study but she says the group has the right model of placing kids in small, stable units. The worst residential care facilities for orphans, she says, tend to be government-run institutions where employees look after the children in shifts. "They often come in in white coats as if they're providing treatment. Usually there's three [caregivers] per day who rotate in and out. By the very nature of what they're doing they're not as committed to each child," Whetten says. "And of course restraining the smaller kids, restraining them physically, is bad for them. We've seen very few of those [orphanages] that are really, really on the bad end and those are usually ones run by governments." Also places where shift workers care for the kids tend to have the wrong organizational structure. For the SOS moms like Sandra Hernandez, there are no shifts. Hers is a 24-hour-a day job. When Naomi gets home after the Señorita Aniversario pageant, Hernandez is waiting anxiously for her on the porch. She wants to hear all the details. Naomi tells how she made it through the first three rounds and how the crowd was cheering as she walked out on stage. All her friends were sure she was going to win. Later that evening Hernandez organizes kids from all 12 of the houses to help clean up an overgrown section of the village next to the soccer field. As the sun fades the kids rake up piles of cut grass and leaves. They haul bushes and small tree limbs off to a pile by the outer fence. The kids also chase each other around. One teenage boy is keen to show that he can carry a bigger bag of leaves and dirt than anyone else. Some of the younger girls practice a song. A young boy from a neighboring house keeps running over to hug Hernandez — for no particular reason. Eventually the work party turns into a soccer game. Hernandez scores three goals but the kids insist she was offside. And what could be more fun than arguing about whether or not someone is cheating at backyard sports? It feels a lot like a big family picnic. Let's go now to the Honduran city of Tela, where it is a big day for Naomi Rodriguez (ph). The 15-year-old is competing in a pageant at school. She's chosen two outfits for the contest. But first, she's helping to make breakfast. 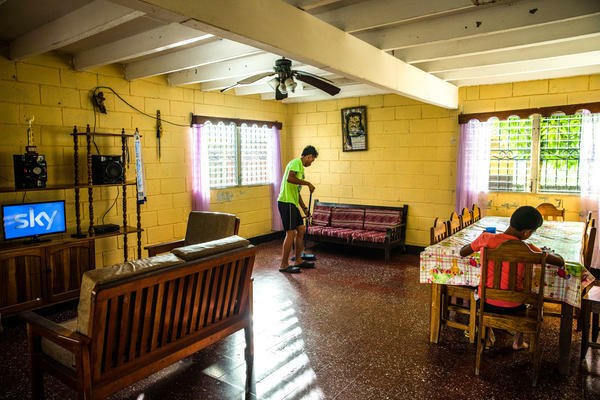 GREENE: This could be the morning routine at many houses in this small Central American city, but this house is special. It's a home for orphans, and as NPR's Jason Beaubien reports, it's part of an international network built around what matters most when it comes to raising kids. JASON BEAUBIEN, BYLINE: The day starts early at the SOS Children's Village in Tela, Honduras. It's 5:30 in the morning. At house No. 9, Naomi and her SOS mom, Sandra Hernandez, are chatting about Naomi's upcoming school day while the two of them make traditional Honduran tortillas called baleadas. Sandra's pounding the balls of dough into plate-sized patties. Four teenagers, including Naomi, live at the house. We're not using any of the minor children's real names because they're wards of the state. The youngest boy is sweeping the backyard. Naomi is helping to cook. Two of the older boys are still asleep. BEAUBIEN: Sandra, who's 45, lives in the house full-time. When she takes her annual vacation, an SOS aunt comes to stay with the kids for a week or two. Sandra says the SOS model gives these children a home that's like a natural family. HERNANDEZ: (Through interpreter) It helps them a lot because they're not isolated. BEAUBIEN: SOS Children's Villages is a global nonprofit that runs nearly 600 residential care facilities for kids in 135 countries. The structure of an SOS Children's Village is actually quite simple - kids who've been separated from their biological parents because of death or abuse or neglect are put in, quote, "family units with a single adult caregiver." Those houses are grouped together as an SOS Village. The houses in Tela are two-story, cinder block buildings. Each has a kitchen and a living room on the ground floor and four bedrooms upstairs. Naomi says her friends from school like coming over because she has such a nice house. NAOMI: (Through interpreter) When we have group homework, they come over because they like coming here. BEAUBIEN: For Sandra, being an SOS mom isn't just a job. This is her family. She was placed in an SOS Children's Village in the Honduran capital of Tegucigalpa at the age of 3, and she grew up there. HERNANDEZ: (Through interpreter) I lived the same situation as them. BEAUBIEN: She says one of the most valuable things she learned and that she tries to pass along to the kids in her care is the importance of having strong daily routines and strong moral values. Naomi grabs her bag with her outfits for the pageant, says goodbye to her mom and heads off to school. BEAUBIEN: On this day, Naomi's classes have been suspended as the school celebrates the 69th anniversary of its founding in Tela. Naomi is one of a dozen contestants in what's essentially a beauty pageant to see who will be crowned Senorita Aniversario - the queen of the school festival. BEAUBIEN: As she walks out onto the stage, the announcer declares that Naomi's hobby is studying, and she hopes to become a doctor. BEAUBIEN: Naomi was placed at the SOS Children's Village when she was 2 years old and has been with Sandra since she was 7. Her math teacher, Jennifer Gamez, says Naomi's one of the best students in the school. JENNIFER GAMEZ: (Through interpreter) You explain something once and she gets it. If she has a question or a doubt, she asks me about it. And her behavior is excellent. BEAUBIEN: Gamez says she's been impressed with many of the students from the SOS village. The organization will reunite them if possible with biological relatives. But the overall goal is to construct a new family for these kids and to make this SOS village their home. In recent years, the idea of raising kids in orphanages has been slipping out of favor. But Duke University professor Kathryn Whetten says her research shows that orphanages aren't inherently bad. KATHRYN WHETTEN: We see the same continuum of bad and good care in the group homes as we see in the family settings. BEAUBIEN: For the last 12 years, Whetten has been following 3,000 kids who were orphaned or separated from their biological parents in five low-and-middle-income countries. Half the kids are in institutions of some kind - government-run orphanages, private group homes. The other half have been placed with extended family members. Whetten has found that the orphans who do well tend to be in stable living conditions, where kids feel connected to other residents. WHETTEN: So creating a family-like environment is what is really important. And that can happen in a family setting, in a small home, or it can happen in an orphanage/institution/group home like SOS. BEAUBIEN: In the early afternoon, when Naomi gets home from the Senorita Aniversario pageant, Sandra is waiting anxiously for her on the porch. BEAUBIEN: Sandra wants to hear all of the details of the event. BEAUBIEN: Naomi tells her how everyone was yelling and cheering when she walked up onto the stage. She laughs as she describes how all her friends were sure she was going to win. She made it all the way to the final round and was one of just three finalists. HERNANDEZ: (Through interpreter) But you'll still represent the school tonight in the festival. That's a big honor. BEAUBIEN: Later that evening, after the boys get home from school, Sandra recruits kids from all 12 of the houses to help clean up an overgrown section of the SOS compound next to the soccer field. As the sun fades, the kids rake up piles of cut grass and leaves. They chase each other around. They sing pop songs. One of the teenage boys is keen to show that he can carry a bigger bag of leaves and dirt than anyone else. Eventually, the work party degenerates into a soccer game. BEAUBIEN: Sandra has just scored her third goal of the game, but the kids are insisting she was offside. And what could be more fun than arguing about whether or not someone is cheating at backyard sports? It feels a lot like a big family picnic. Jason Beaubien, NPR News, Tela, Honduras. (SOUNDBITE OF BALMORHEA'S "MASOLLAN") Transcript provided by NPR, Copyright NPR.